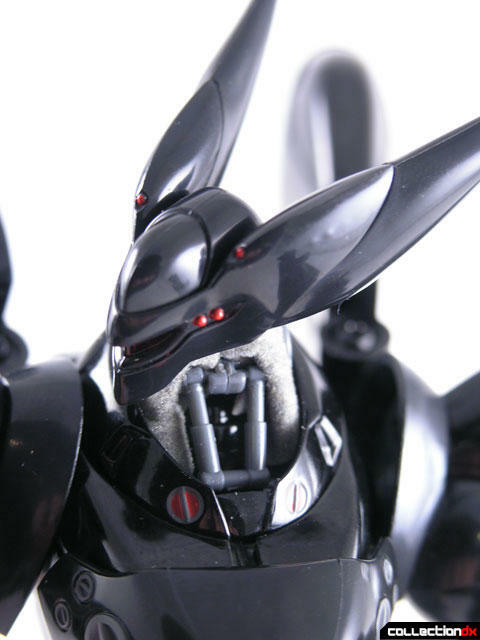 The Revoltech was just a tease. The CM’s Corps Brave Gokin Griffon is the real deal. 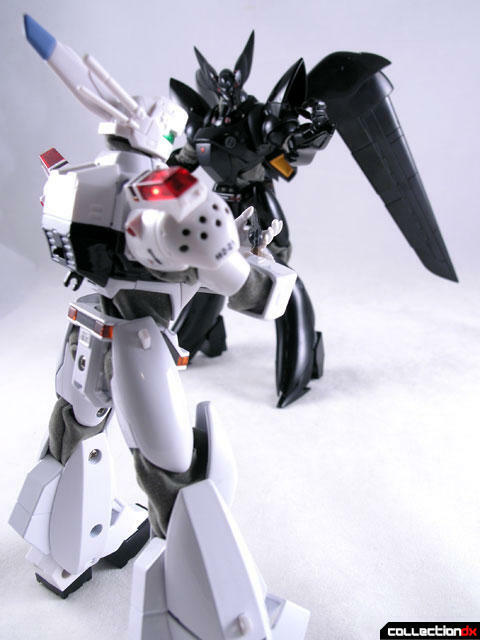 The Griffon Flight Unit Version Brave Gokin (グリフォン フライトユニット Ver ブレイブ合金) comes from the anime series Mobile Police Patlabor (機動警察パトレイバー). 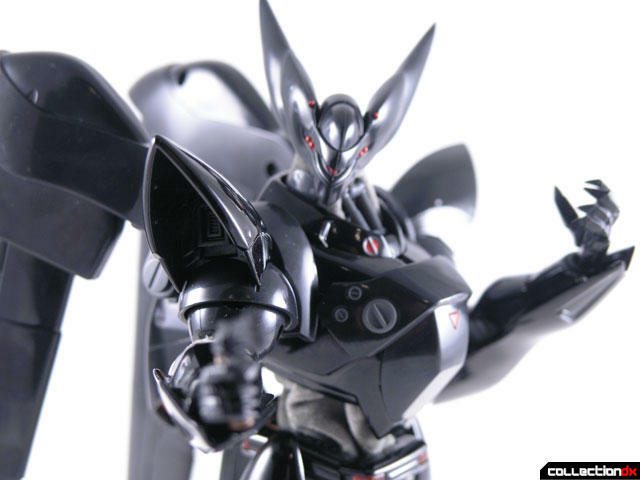 In the series, the Griffon is developed in secret by the Shaft Enterprise company. The Griffon is meant to be the next generation of labor, and to prove it, is set out to defeat the Ingram series of labors. The pilot, a 15 year old Indian boy named Bud Harchand, develops a rivalry with Noa Izumi, the ace pilot of the Ingram unit 1 (aka Alphonse). 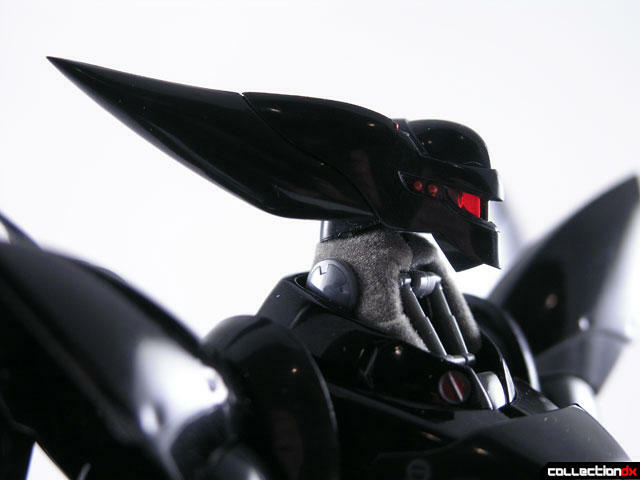 The Griffon’s sleek black lines translate well into toy form. It looks like a mooth, agile machine. CM’s has hit a home run with this one. 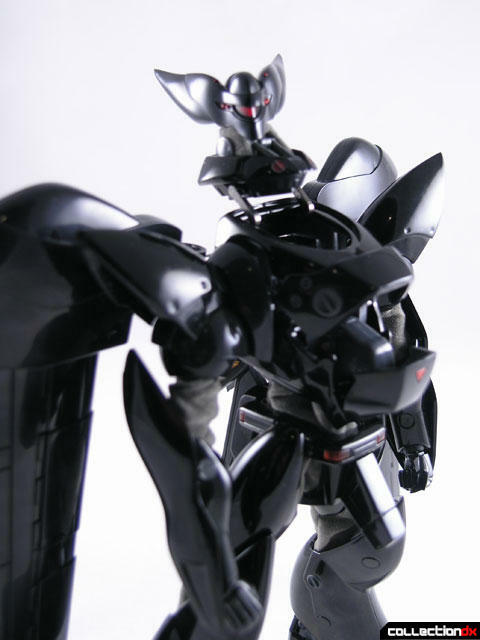 It is the logical next step in the line of Brave Gokin, and a perfect companion piece to the Ingram. 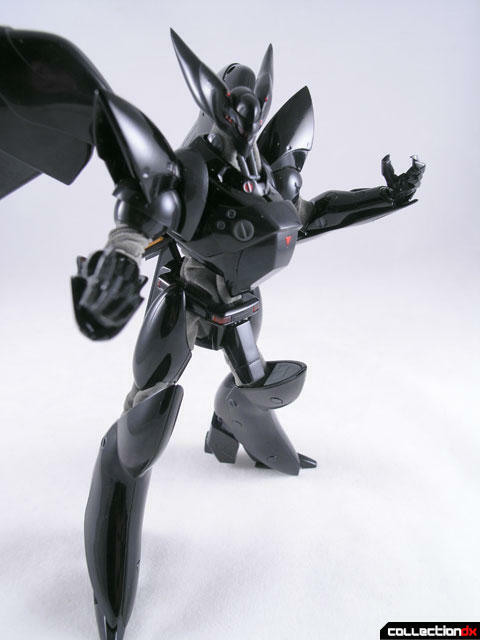 The toy stands about 8 inches tall and has a wingspan of about 12 inches. The Griffon has an ample amount of metal, giving the toy a good, solid feel. Other parts on the toy are made of ABS plastic and cloth for the joint coverings. This labor has more articulation than the previous gokin labors. Starting from the top, the head is on a ball joint with an additional joint on the neck. Each shoulder is a ball joint, with another ball joint in the bicep. The elbows appear to be double jointed, but I cannot tell for sure due to the cloth covering. The wrists are ball joints and the hands can be popped out with ease. 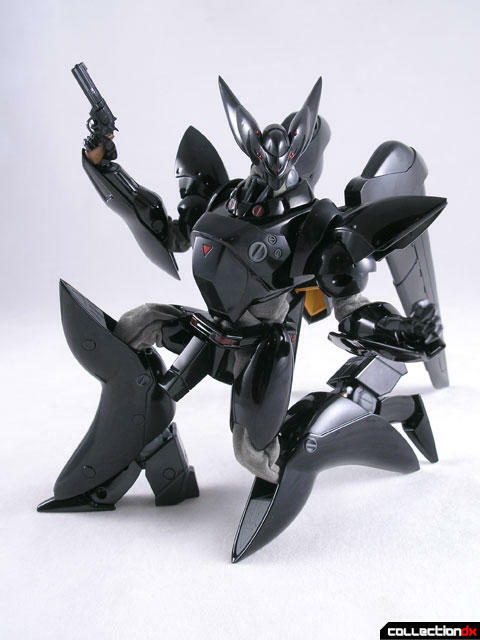 The waist joint is covered in a cloth coating and can both rotate and tilt up and down. It appears to be a ball joint, but movement is limited due to the placement of the tail fin and how it fits between the jets on the back. Hip joints are ball jointed and cloth covered, as is the double-jointed knee. The feet are on a ball joint and include working pistons in the rear. 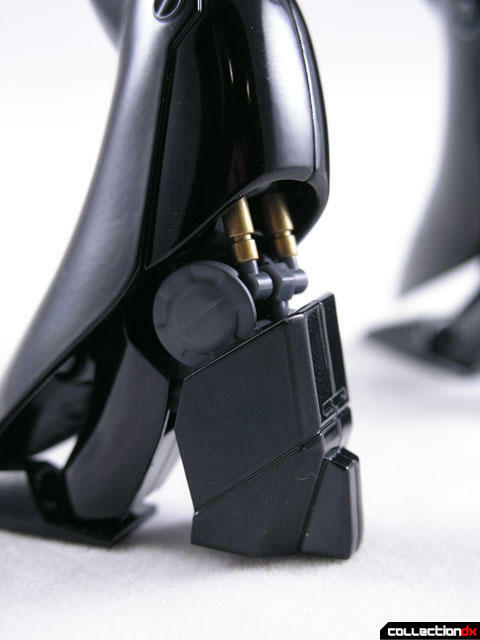 The foot itself is made out of three separate diecast pieces and is articulated at the ankle and toe. 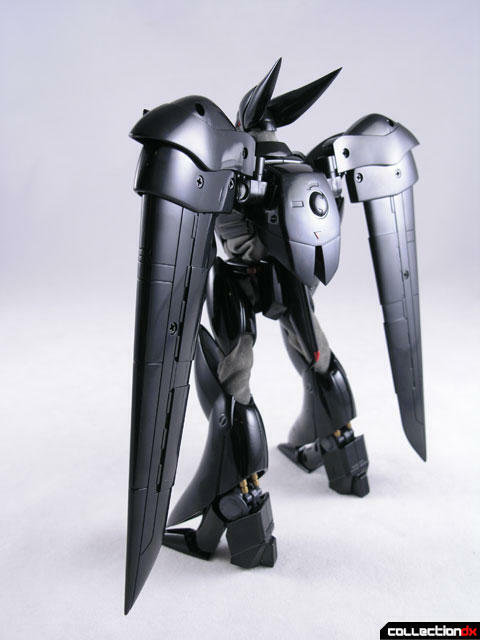 The wings need to be plugged into two holes on the back, and are fully articulated. The wings can rotate and move forward and back with nicely detented joints. The wings also can spread out with two moveable wing sections. You can access the cockpit by first lifting up the head unit. From here you can see the top of the small “Bud” figure. From here you pull up on the cowling and pull down the chest panel in front to have full access to the inside of the Griffon. The pilot does not seem to be removable. The Griffon’s accessories include various hands and a revolver. The hands include open hands, a gun holding hand, a “thumbs-up” hand, and 2 closed fists. The revolver is the same one that is included with the Ingram. This version is the “Flight Unit” version. There is also an “Aqua” version that swaps out the wings for undersea rocket packs and also includes a bonus ripped-off Ingram unit 2 head. While the griffon is a remarkable toy, there are a few noticeable flaws. No electronics. While the Ingram had electronic shoulder lights, the griffon includes no electronics at all. It would have been nice to have a glowing eye. No stand. The Ingram came with a nice stand, the griffon has none. Watch out for paint chips – While my toy does not have any chips, you can see where it is likely to happen. Where the upper legs meet the waist looks like a prime spot for chippage. Loose codpiece. The protrusion from the waist is a separate plastic part, and I actually managed to knock mine off, loosening the plastic in the process. I was able to unscrew the part and re-attach it, but I think CM’s could have found a better method for this. No accessories. CM’s could have very easily packaged the aqua unit in with this, as well as the unit 2 head. 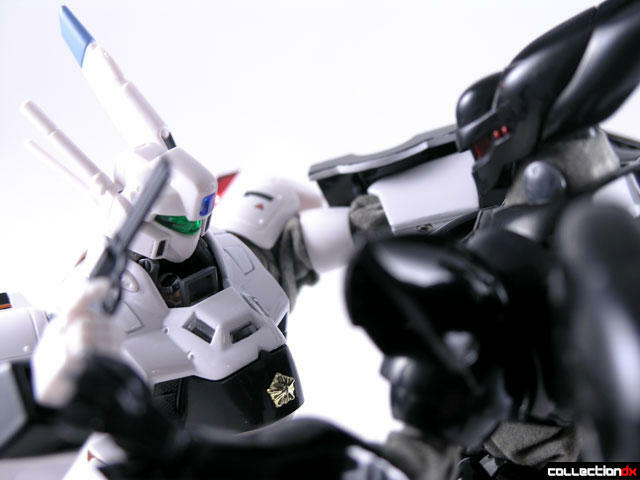 But why do that when you can sell another toy to hungry otaku? Well, this otaku is sick of it. Just pack all the accessories in one box, please? Despite the minor gripes (I had to really think hard to come up with things I didn’t like about it), the Griffon is a great toy, and another shining example of why CM’s is one of the most exciting toy makers right now. Not only is it fantastic looking and loaded with metal, but its durable. You never feel scared picking this thing up and flying it around the room. 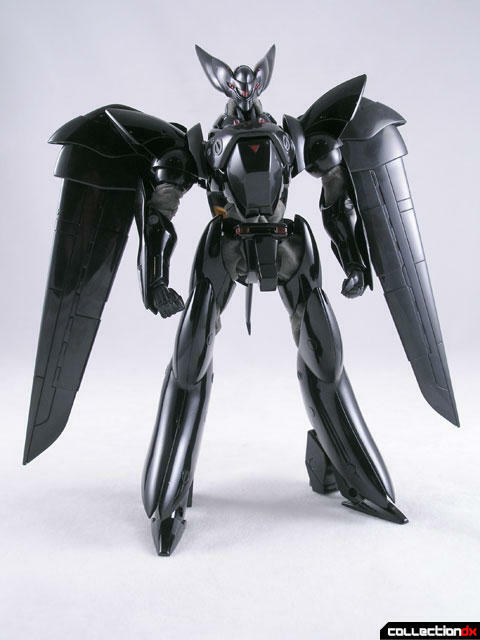 Brave Gokin 09 Griffon is available from HobbyLink Japan. Seconded, and seconded. Agreed, Josh, good one! Came across it today in a toy store, picked it up . And can I say it's far better then I thought it would be, I was laughing maniacally when I held it for the first time... that good ! I finally found one on ebay for an affordable price, about $75 before shipping in the US. :) I am so glad I waited. Prior, it was hard to find one for under $130. HLJ is having a sale of the supposedly limited Aqua version. Good thing the Griffon doesn't come with an antenna that you can lose easily, like the Ingram!